You are currently browsing the category archive for the ‘dormice’ category. Meet Dora the Dormouse. She’s very special (and hugely cute). Dora made her first public appearance yesterday at our dormouse and hedge training day. She was the icing on the cake! What? Why? How? I hear you exclaim. 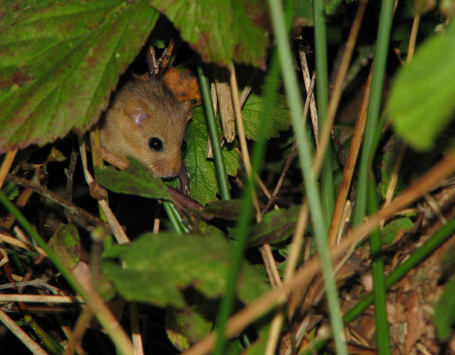 ‘Aren’t dormice a rare and protected species?’ Yes, yes they are, you’re quite right. So let me tell you Dora’s story. 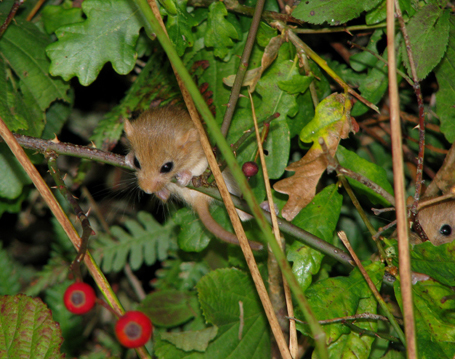 Over the next month or so we’re holding a series of training days on hedges, hedgerows, their management and their wildlife, especially the dormouse. As you probably gathered in various other posts I’ve written, we have magnificent hedges on the farm which are home to a thriving dormice population. This year numbers appear to be down compared to previous years – probably the result of three wet summers in a row; but still, when people come on these training days what they are really keen to see are dormice nests and dormice! Dormice nests, yes, we can generally oblige, but dormice? Not a given, more luck than anything else. Now I’d heard that Paignton Zoo (who are involved in a dormouse breeding programme) occasionally need to find knowledgeable homes to care for individuals unsuitable for release into the wild. This would be, I thought, a wonderful opportunity to show people a real live dormouse. I contacted the zoo to see if they had anything and would consider us appropriate guardians. Unfortunately they’d recently just re-homed the last of their old breeding males the keeper Julian told me, but he would have another look and call me…! On Thursday, just as I’d given up all hope, he contacted me and said they had a young female which had lost her back leg. It was completely healed; she was fine, she’d been checked by the vet, it was really unnoticeable, but they’d be willing to loan her to us if I was interested. She couldn’t be released into the wild and they wouldn’t want to breed from her. Was I interested? You bet! So on Friday afternoon we went to collect Dora. Yesterday, Saturday, was the training day, and the weather couldn’t have been more perfect. A golden afternoon. Jane from UrbanExtension came all the way from Dorset with fellow officers from the Dorset Wildlife Trust. Not only did we find dormouse nests we also saw three wild dormice…and then, of course, there was Dora! “In the reed bed? Really? That’s extraordinary. I’ll let Robert know. He’ll be fascinated and down there like a dose of salts I shouldn’t be surprised!” I was on the phone to a friend of mine who had just called to say that some relatives staying with them had found a dormouse nest in the reed bed by the edge of their ‘lake’. Not only had they found the nest but the resident had obliged by coming out and letting them take photos! Robert, you see, has a bit of a reputation of never believing anyone’s natural history sightings – animal, plant or mineral – ‘proof’ is essential! Apparently, yes they do, though it’s more likely in those parts of the country which support good reed bed systems. I guess in Devon, with our glorious hedgerows and connected woodlands, we just don’t look for them in other places that often. Though Maggie of Wheatland Farm did say they found a nest complete with dormouse in the middle of their area of culm grassland which was well away from trees (again with photo to prove it! Do click on the link to see them). “It was freezing. Really, really freezing.” Olly had just got back from Bude yesterday evening. He body-surfs and taking advantage of the clocks changing and the glorious warm day he’d nipped down to Bude for an early evening surf. “Oh yes. The lot. Hood, gloves, socks. I wear the winter one all year now. Because I’m in the water constantly for maybe an hour or more I get really cold, not like board-surfers.” He hung over the Aga “But it was freezing. Lots of people out there though.” He draped himself across the whole Aga top “And by the way, what’s with all the speed and CCTV cameras down our lane? Not too sure about that!” Our farm lane is half a mile long, lumpy, bumpy, windy and not known for speeding along. CCTV or speed camera? They have appeared every 10m along our lane. they are dormouse nest tubes! I suddenly have a vision of giant alien beings carrying out experiments on some weirdly strange little human-creatures they’ve noticed. State of the art mansions are placed in tempting locations. What would we do? Assemblyof dormice nest tubes taking place in the warm and ambient atmosphere of the biome! 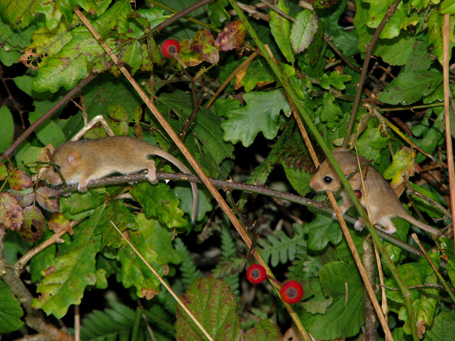 juvenile dormice - can you see the currant eye of the second one on the right hand side? I had to do another dormouse post. Just look at these photos! Also Robert has, this weekend, been to the 7th International Dormouse Conference, attended by some 150 people from all over Europe and even as far a field as Japan and South Africa, all passionate about these amazingly appealing mammals. holding onto a rush stem whilst performing an intricate 'manover'! Through Robert’s interest I’m also learning quite a bit about them too. Dormice do best in places that have hot summers and cold winters, like many central and eastern European countries, so the cool wet summer we’ve been having must have been as difficult for them as it was for us. They will have delayed their breeding for as long as possible, but by late August must have decided it’s now or never, and the adult females got on with the business of constructing their nests of woven grass, waterproofed with layers of leaves, in as sheltered and as warm places as possible. Earlier this month, Robert found one such nest low down in bramble and rose growth on the edge of one of our hedges, and when he gently disturbed it an adult emerged, which he thought looked like a lactating female as she was rather thin. On Sunday evening he went back and was bowled over when three young came out of the nest and posed for him on rose and rush stems out in the open. They are quite the cutest of creatures. Luckily there are still plenty of hips and other fruits and berries around, so it is likely that these youngsters will manage to put on enough weight to safely go into hibernation, probably sometimes in October. A bit later, and they probably would not have survived. At the conference Robert heard that in Lithuania, where they estimate they have a staggering one million dormice (the country remains densely wooded), females sometimes produce three broods a year, although this is exceptional. In England, they sometimes manage two, although probably not this year! But at least on Locks Park one female has succeeded in producing a litter of three, or possibly more, young to keep the population going, together with surviving adults which can live for four years in the wild (and six in captivity). 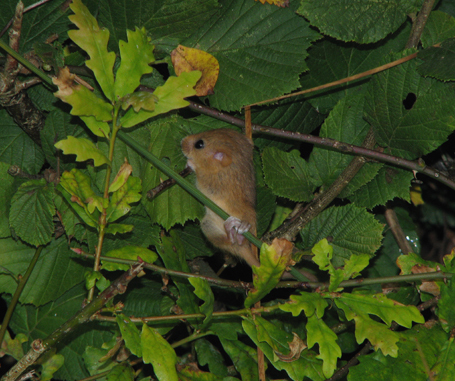 Robert also learnt that dormice are promiscuous – males and females don’t form pair bonds, instead females mate with several males, so the young in a single litter may all have different fathers; also males try their luck as often as they can, travelling quite large distances in the process. This, did you know, is the normal pattern of mating behaviour in mammals – and our ‘human systems’, of either marriage or harems, are unusual, but not unknown. Umm, well, maybe. Possibly those researchers are not in the habit of reading Hello and OK! magazines or watching the odd soap on telly. But back to those oh-so-appealing photos. My mother had a pet dormouse when she was a school girl; I have ancient photos of her with him, he was called Rusty. I’m green with envy! 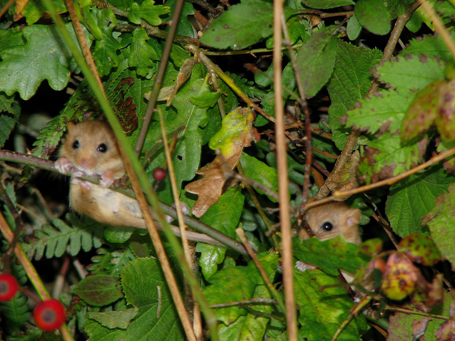 So here’s what you’ve been waiting for…Locks Park Farm dormice! Every year I sell some of my cows and heifers. Generally it’s a handful of my yearling heifers and a few cows from the main herd.